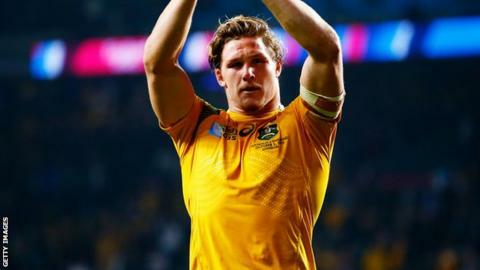 Australia flanker Michael Hooper will miss Saturday's World Cup Pool A decider against Wales after being suspended for one week. Hooper, 23, was cited for clearing out Mike Brown at a ruck during the Wallabies' 33-13 win against England. Asked if Hooper's ban makes any difference to Wales' preparations for the match, attack coach Rob Howley replied: "No. I spoke before the England game really and what we've done over the last 16 weeks is to focus on ourselves in terms of selection and training and we'll do exactly the same this week, it's not different to us. "It's something you're aware of when you watch Australia - obviously Hooper and [David] Pocock working together. "But Sean McMahon was outstanding against us in the autumn series. I think whoever puts on that gold jersey will be looking to play to his best. "We always look forward to playing Australia. The last couple of games we've had great games against them." Brown was knocked out during England's win over Italy in the Six Nations in February. He returned to play against France later in the tournament but "didn't feel quite right" afterwards and missed the remainder of the Premiership season. He was cleared of concussion symptoms and returned to training in June and last weekend's incident with Hooper prompted an angry reaction from the England full-back. "I've taken an accidental shoulder to the head before with bad consequences so how am I going to react to one done on purpose?" Brown tweeted. "It should have been dealt with by the referee and his assistant at the time. Both stood two metres away looking at it. "I have no interest in him getting banned after and had nothing to do with it."